Ever hit a golf ball 400 yards in two shots and then take 4 more shots within 100 yards for a delicious double bogey? That sticks with you, and usually affects the rest of the round too. The secret to better golf is being lethal inside 100 yards and I want to help you become lethal inside 100 yards. So what I've done is found the best wedges for high handicappers and beginners to give you some suggestions to get more joy on the course without breaking the bank and splurging on unnecessarily expensive equipment. I should also mention, I LOVE saving money on golf equipment so I don't usually recommend the expensive stuff. If you're unsure what kind of wedge you need, if you’re only going to buy one wedge, get a great sand wedge with either 56 or 58 degrees of loft and at least 10 degrees of bounce. Keep reading to find out why. Easiest wedge to get out of bunkers first time and chip around the green. With a bit of practice, it's a great club for approaches inside 100 yards. What makes a wedge lethal? From our experience and taking inspiration from master club fitter Tom Wishon , we recommend a sand wedge with a wide sole to take your short game to the next level. This bigger sole gives the wedge what is called bounce. More bounce means it's easier to get the ball airborne. But you’re probably thinking “what the hell is bounce”? Before we get into that, understand that it’s the most important characteristic of a wedge to give us more forgiveness. Forgiveness is our priority as higher handicappers so we can get the ball off the ground and going where we want when we want. Bounce helps us do that. To help you find the best wedge for high handicappers & beginners, I focused on bounce as the main criteria. “Bounce refers to the lowest part of the sole, that part of the wedge sole that is actually in contact with the ground at address and that causes the front of the sole to be off the ground at address. How does bounce make a club forgiving? Do you find it difficult to hit the ball out of bunkers first time? I know I used to. There's nothing more embarrassing than taking 4 to get out of a bunker. But check out my guide to hitting bunker shots for beginners. For 90% of golfers, the wedge should have a lot bounce to literally bounce off the surface of the sand and float the ball out on a pillow of sand. When we start golf we all hit a lot of fat shots. Fat means you hit the earth before your ball. If your SW has too little bounce, it will dig into the ground on a fat shot and your ball will go nowhere. If the wedge has more bounce, it will literally bounce off the earth and make good contact, sending the ball to your target. This will help your shots inside 100 yards. Cleveland has been the foremost name in wedges for years. They’ve really thought about the higher handicap player with this club. Their data analysis showed that golfers with a handicap over 12, find the green only 54% of the time out of the bunker so they've created a sand wedge that will get you guys out 100% of the time. ​The Smart Sole S wedge gets you out the bunker in one shot with almost no effort with the very wide sole. The weird looking underside is unnoticeable from the top when addressing the ball and actually looks like a standard wedge. The weight behind the sweet spot has been distributed around the perimeter of the club like a standard iron. The Tour style wedges are designed with all the weight behind the sweet spot which makes them harder to hit. This perimeter weighting makes the wedge even more forgiving and will more than likely match your cavity backed irons in design. Add the C wedge in the Smart Sole range and you have two potent wedges that are going to severely lower your scores. ﻿﻿﻿﻿﻿﻿﻿﻿﻿﻿The C wedge has less loft at 42°and has been designed for playing around the green but can be used just as effectively from 125 yards with a full swing. While it looks quite radical, this club gets the job done every time. Easily the best wedges for a high handicapper or beginner struggling with the short game or looking for their first wedges. These two clubs have the potential to rapidly revolutionize your short game from bunkers to green side to pitch shots within 100 yards. No BS. Wilson is a very underrated but excellent golf club manufacturer. They’ve designed a winner with this range of wedges and it’s going to be very difficult to find better value than the Wilson Harmonized Golf Wedge at this price. The leading edge of the club is designed to get under the ball and prevent too much digging. The feel off the face is responsive and the ball flies high and drops with spin to stick on the greens. If you find you enjoy your 56°, Wilson produce 52° and 60° models to add to your set. For very little money, you can get your hands on 3 wedges: 52°, 56° and a 60°. That makes a perfect 4° gap between the pitching wedge in your set (48°), the Gap (52°), Sand (56°) & Lob (60°) in the Wilson Harmonized wedges. The Wilson Harmonized wedges are the best wedges for beginners to start with and getting the consistent gapping between your wedges will help with hitting the right distances from 120 yards down to 70 yards time and time again. The confidence you’ll get by not having to hit half shots into greens will change your outlook on life. At this stage of your golf career, you probably won't be able to discern between a premium wedge and a value wedge. So it makes sense to keep the wallet fat and try out a wedge like the Harmonized. Once again Cleveland appears on this list. There’s no escaping the quality of their wedges. I really like the 56° Cleveland CBX wedge. This wedge is really easy to hit because Cleveland have put 12 degrees bounce on this club with a nice thick sole to glide through the turf, getting the ball into the air easily. The cavity-back design in the CBX is more forgiving than the blade wedges most often found nowadays. Forgiveness is the magic word for high handicappers and beginners and in a wedge, it's even more important so you can get onto the green easily to putt for some pars. With the cavity back and chunky sole on the CBX, it's going to be much easier to get out of the bunkers, prevent chunked chips around the green and improve approach shots onto the greens. Like with irons, the cavity back allows for more perimeter weighting which is unique for a premium wedge.The perimeter weighting means you’ll still get distance and spin on off-center strikes because of the extra weight behind the ball even on mishits. This premium wedge functions as a game improvement club by bringing all the elements of forgiveness to the club head. It's always a safe bet with Cleveland wedges but this is easily of the best wedges for high handicappers and beginners looking to upgrade. Tour Edge is no stranger to the golf market. And their Bazooka driver range is quite famous indeed. Their Bazooka wedge range might be a little less well-known. At 56 degrees loft and 11 degrees bounce, the 1Out Plus is exactly what we're looking for to escape the sand and never duff a chip again. In a similar way to the Cleveland Smart Soles, this club looks really weird. It's reminiscent of the Ray Cook Alien wedge which was also a head-turner. This club is an ideal fit for you struggling to get out of bunkers. When you hit the bunker shot, the club usually gets stuck in the sand or you decelerate on the shot and the ball stays in the damn bunker. The 1Out Plus has been designed to get out of sand specifically but is effective on shots inside 100 yards and greenside chipping over obstacles. You'll find the heavy, wide sole will make the club do the work and you won't need to manipulate the club for a consistent ball flight. The heaviness and shape will take time to get used to but once the trust in the club is there, it's incredibly easy. Not everyone is looking for expensive premium wedges or wants to spend a ton of cash on golf. You might be someone who plays very casually, for business or on a shoestring and this might be the first time you've looked for wedges. Whichever way you play this game, these Pinemeadow wedges kill three birds with one stone. 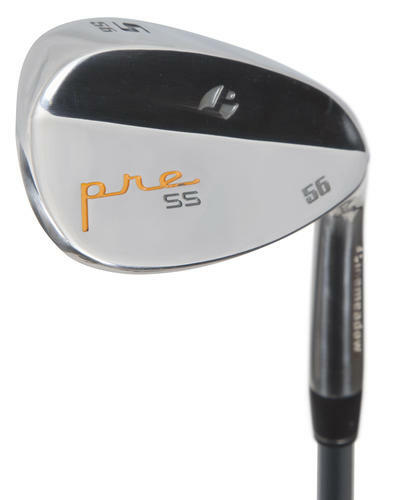 The Pre Wedges (strange name) are an incredibly popular club and for the price it’s easy to see why. You get a set of 52°, 56° and 60° with wide soles and sleek stainless finishes. The Pinemeadow Pre Wedge set are the best wedges for high handicappers and beginners looking for a one stop solution. For a low investment, you can punish and put these through their paces. You can learn the ins and outs of wedges with this set and once you've learned enough, you can go ahead and get yourself a premium wedge. This is a one stop solution for beginners or high handicappers. If you're new to wedges, this is a great set to start your lethal superhero short game training before you're ready for upgrading to the ever-pricey premium wedges. The clubs have been designed with the beginner in mind which is evident in the sand wedge having 56° loft and 12° bounce - great for what we're looking for. Add in the AW (attack wedge) & lob wedge and for under $80, you're smiling. What defines a wedge from an iron is loft. The 9 iron normally has around 44° of loft. Anything above 45° is considered a wedge. Wedges can be used on fuller shots from 140 yards and in depending on your swing speed. It’s often said that a wedge should not be hit at full power. The idea behind wedges is to use them for controlled shots instead of power shots. Their job is to get you close to the hole, not long distances. 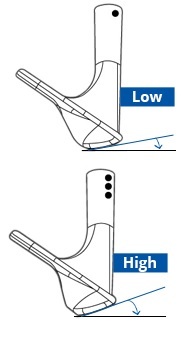 The higher loft produces higher ball flight and often more spin. When do we use wedges? We use wedges from bunkers and for chipping around the green. Most golfers end up finding one club they like to hit out of bunkers with, chip greenside with and hit ¾ shots with. Personally I like a pitching wedge for greenside chipping, lob wedge from the sand and sand wedge for ¾ approach shots as well as chipping from the rough. The choice is yours and there is no right or wrong way when you find what works but starting with the above best wedges for high handicappers and beginners will make life a lot easier. The pitching wedge is most common and has a loft between 44° and 48° which you will get in your set of irons. These are great for greenside chipping. 50° to 53° which fills the gap between PW and SW for when you need to close the gap in distance. The sand wedge normally has 54° to 58° loft with fat soles that have 10° to 12° bounce which is essential for bunkers and shots within 100 yards. The thick underside helps to glide through longer grass and sand while also getting the ball airborne off shorter grass. In our opinion, the best wedge for high handicappers and beginners is a sand wedge. The lob wedge at 60° to 64° loft is perfect for hitting it over bunkers around the green, short bunker shots and within 80 or 90 yards. It can add another dimension to your game allowing you to take fuller swings inside 100 yards instead of those tricky half swings with sand wedges! Lob wedges over 60° are not practical for the average golfer. Are wedges really that important? If we add up the total shots you play per round with these few clubs in these situations, you’ll see it's roughly 20-30% of the game. What is the best wedge for high handicappers and beginners? The best wedge for high handicappers and beginners is one with maximum FORGIVENESS. My main aim is to help you pick the best clubs for your game without breaking the bank or being lured into buying crappy clubs that will disappoint you. I hope this guide was helpful and you find yourself a decent wedge or set of wedges to take your game to the next level from within 100 yards.